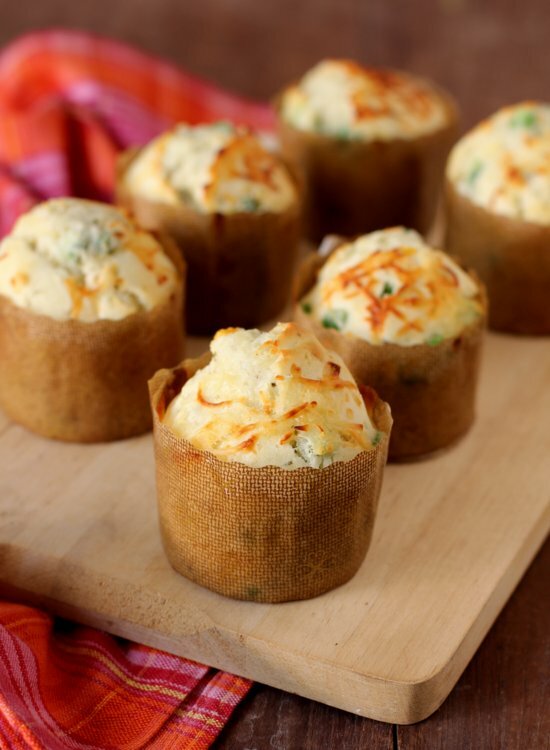 I don’t know what took me so long to post these savory muffins that I make so often for my son as they are his favorite breakfast or mid morning snack. 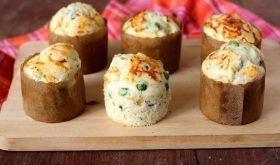 I am always on the look out for fast and easy breakfast recipes for kids and corn savory muffins recipe fits the bill. They work great for breakfast, school snack and picnic food as well. Today’s savory muffins recipe uses plain flour but since I make them often for my son, I use half a cup each of plain flour and whole wheat flour and 1/4 cup groud oats. I stock on corn and you will find a packet in my freezer at any given time and I also had some green peas to use up. So sweet corn kernels, green peas, green chili paste, coriander leaves and loads of cheese gave the muffins a lot of flavor. Soft, moist, cheesy and addictive. The variations are endless and few flavorful combinations that I usually make are spinach & corn/roasted bell peppers & corn/ sausages & eggs. Sieve the plain flour and baking powder, set aside. In a mixing bowl, add olive oil, butter, salt, green chili paste and coriander leaves and mix well with a whisk. Slowly add the egg mixture and mix well. Add half of the flour mixture and fold with a spatula. Next add half of the milk and gently fold to combine. Add the remaining flour and fold, followed by the rest of the milk. Next add the boiled sweet corn kernels, green peas and grated cheese and fold to combine. Spoon batter into paper cups or muffin pans that are lined with paper liners. Sprinkle some grated cheese on top (optional). Bake at 180 C for 18-20mins or until a tooth pick inserted into the centre comes out clean. Best served hot or warm from the oven. 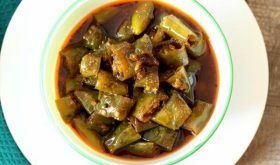 You can use 1/4 tsp black pepper powder or red chili flakes instead of green chili paste. Instead of egg, you can increase baking powder by 1/2 tsp and add 1/2 tbsp lemon juice to the milk and set aside for 3 mts and use as required. 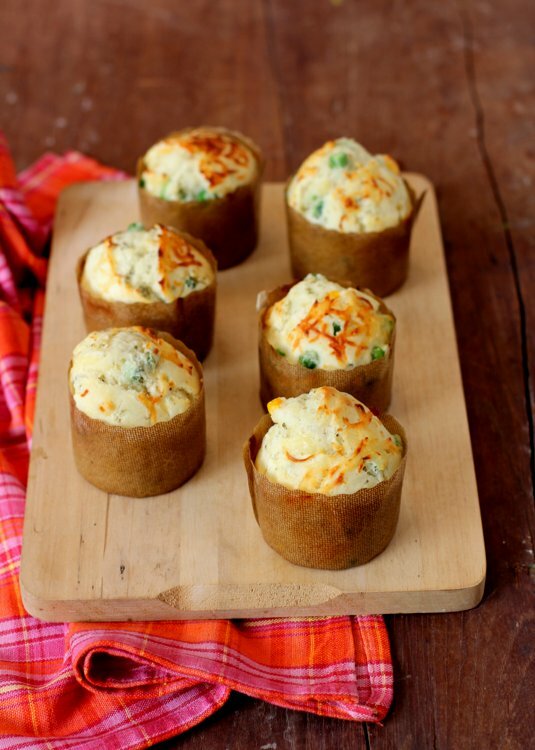 By Sailu Published: July 22, 2014 Savory muffins are among the most simple, fast and easy breakfast recipes for kids. My kid's favorite flavor combination is healthy spinach, corn & cheese. we dont like cheese ,can i skip it ,does it make a huge difference in taste.what is the best alternative. You can skip the cheese. The muffins taste good without the cheese too. It is like cupcake batter. Hi Sailus, can we avoid the eggs in this recipe? Hi Sailu – What would be the proportion if you have to substitute part of plain flour with wheat flour and/or oats ? I also need the egg less recipe. Tempting muffins! Where did you buy these muffin liners from? I am from Bangalore, and failed to find such liners here.